With law enforcment becoming ever more strickt with modifying your vehicle with performance parts, the need for more discreet performance parts have increased to keep a low profile. 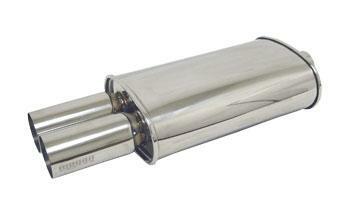 The M-DT is designed with a more conservative Oval design rather than the common Canister style universal mufflers. These are more discreet to law enforcment and although the feature the same perforated-core design as the Canister mufflers that we sell, they offer a deeper more mellow tone due to the increased amount of packing that is contained within the muffler casing.